Coin Display Cases can be a great way to show off your collection of State Quarters or Presidential Dollars, or just about any coins from your coin collection. Coin Collecting Cases come in a wide range of sizes and shapes to meet your needs or to complement the decor of your home. Champion makes some great Custom Wood Coin Frames that are well worth checking out. A coin collector case also makes a great gift for the coin enthusiast on your gift list. You might consider them for Graduations, Weddings, Anniversaries, or House Warming gifts. They also make great gifts for Births or Birthdays. For example, coin collecting cases that hold and display a complete year set would be great for births and birthdays, or even graduations. What better way to commemorate a special year. Display Cases are also great for your own coin collections. They are available in sizes to hold just one or two coins or multiple coins. Some can be displayed on tables or mantels while others are made for hanging on a wall. 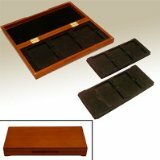 Materials inlude fine woods like oak, walnut or cherry with glass fronts so that you have a great view of your coins. Other coin collecting cases are beautiful wood boxes that offer great protection and allow for convenient storage out of site while still making it possible to display and show off your coins when the notion strikes. It is not a good idea to display rare and valuable coins for all to see. You could be setting yourself up as a possible target for burglars.